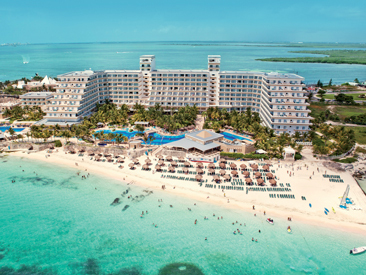 Riu Caribe is a lively, all-inclusive, beachfront resort in Cancun built around catering to families and couples, alike. Offering a wide array of age-appropriate activities and entertainment options, including three pools, water sports, a full-service health and beauty spa, a fitness center, 24-hour food options, and a supervised RiuLand children's club, Riu Caribe is sure to provide entertainment at every turn for those seeking an adventurous stay in paradise. 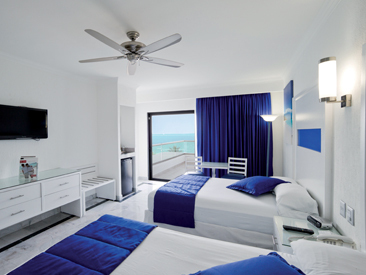 The lively Riu Caribe is a stunning 9-story, all-inclusive beachfront resort located near Cancun's famous shopping and nightlife. The resort caters to families and couples, and everyone will delight in an astounding array of age-appropriate activities and entertainment options. Three pools surrounded by lush tropical grounds and a long, beautiful stretch of powdery white-sand beach beckon guests by day. In addition to a host of included water sports, the resort features a full-service health and beauty spa, a fitness center, 24-hour food and beverage service, a supervised RiuLand children's club and theme parties and shows every night. Located in Cancun's world famous Hotel Zone, just 1.9 miles from great shopping, 2.5 miles from downtown Cancun and 13 miles from the airport. Local artisans, including a cigar roller, occasionally set up tables in the four-story-atrium lobby so guests can browse and shop without leaving the resort. Also in the lobby are gardens, a parakeet cage, a game area and an expansive lounge. A shop off the lobby sells gifts, clothing, snacks and sundries. 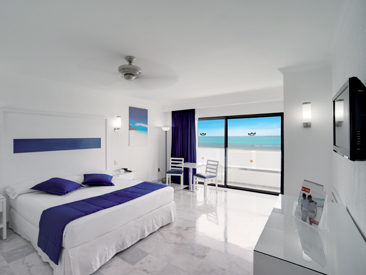 The powdery white beach is only steps away from the lively pool area. The resort's ideal location provides relatively calm waters, perfect for trying out water sports of all kinds. In addition to the included water sports, parasailing, jet skiing and banana boat rides are offered at the independently operated dive shop right on the resort's beach for an additional charge. A full-service spa and fitness center features treatment rooms, sauna, steam room and Jacuzzi. Plus two lighted tennis courts, table tennis, beach volleyball, introductory scuba diving lessons, snorkeling equipment and non-motorized water sports equipment including windsurfers, sailboats, kayaks and body boards are included for all guests. Riu Caribe provides preferential conditions and additional value to their guests when contacting, booking and paying directly at Riviera Cancun golf course. Per couple, per stay; Does not apply with other promotions or discounts; min. age is 18. 10% off all spa services for groups (10 room min.) or 20% discount on all spa services when booking online in advance with minimum 72-hour notice. Per adult, per stay; not combinable with other promotions; min. age is 18. One per stay. Tour leader should claim by email. *No complementary massages will be offered directly at the spa without the vouvher.